This post provides a quick and easy way to generate some test records for your unit or system integration testing. The reason I initially started to work on a ‘virtualisation’ approach for Data Vault was to pre-test the ETLs that were generated using whatever automation technique (e.g. SQL, BIML and many others). Using the virtual Data Warehouse – the views I have been posting about recently – you get a representation of the Data Warehouse as it would be were you to create the tables and populate them with ETL processes. The ability to preview the end result saves time as you don’t have to run ETL to validate the results. Typical issues are incorrect hash keys (wrong order). These and other similar errors can result in issues related to referential integrity or data type mapping. It turns out I was looking for a way to quickly test the involved metadata using randomly created records. This way I can quickly generate some data, quickly generate the (virtual) Data Warehouse and then quickly ensure that all metadata is correct using the random data. Very convenient! After this step the regular ETL processes can be generated from the same metadata if required and a physical instance of the Data Warehouse can be loaded. This is all a long way from manually creating ETL processes using Informatica and SSIS! 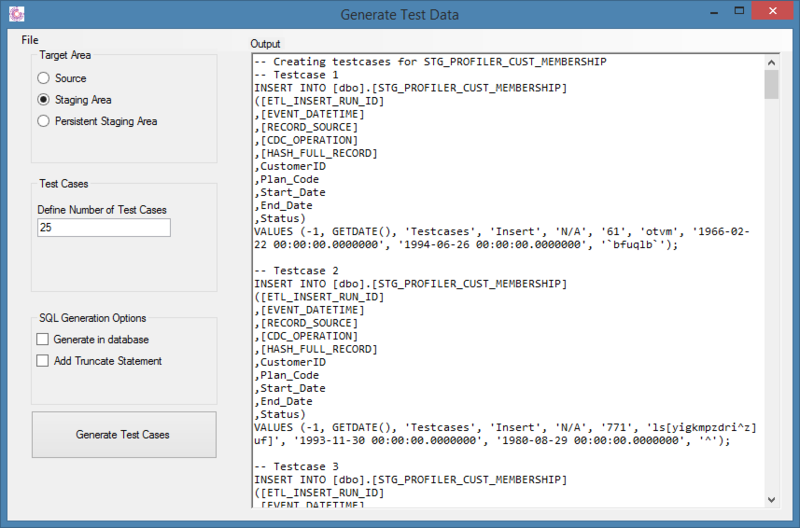 In any case, I created the script below that basically looks at the table structure (metadata in the catalog / data dictionary) and generates matching random values depending on the target data type and range. The SQL is provided below or can be downloaded here. Nothing fancy, but it does the trick. Of course the specific metadata attributes can be substituted for something else.